Ironically, the very first “live” long line rescue I did was a body recovery. 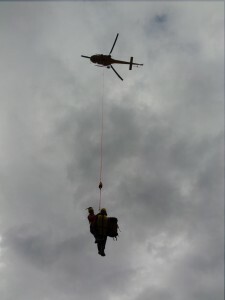 The hiker in question had fallen several hundred feet – 800 or 900. He slid on snow, bounced off trees, and rocks and fell over a cliff. He was strangely peaceful, his body looked uninjured. He looked, for all the world, asleep. Until we had to roll him into a body bag. His equipment was scattered for a long distance uphill from where we found him, so we did our best to recover it. I recall finding wallet, keys, food, water, navigation equipment. We also recovered snowshoes, ice axe, hiking poles, microspikes, and “traction devices” – those things that are like chains for your feet. None of these made a difference. In SAR we often talk about the 10 essentials, but as I said the other day on CBC, the one thing you can’t put in your bag or show on TV is training. You need to know how to use all that stuff. You need to know what it’s for, when to use it, and when it’s no longer appropriate. Walking seems simple, it’s one of the first things we learn, before we learn how to talk. When you walk in the mountains you need to learn to walk again and you need the right tools to do it. I’ve noticed that the Mountaineers have a book dedicated to snow travel. Not sure how long the link will be good, but The Mountaineers have some of the finest backcountry manuals around. Read a book, take a course, get out and practise on low consequence slopes. Be safe, and I hope I never have to roll you into a body bag. 1 Pings/Trackbacks for "Knowing how to use it"